Poor indeed is the garden in which birds find no homes (Abram Urban) and being surrounded by trees, gardens and birds is a joy for me. Amazingly, as I write these words, a yellow breasted hummingbird whirrs to my window. Suddenly s/he flies through the open door and hovers and hums in front of me. It’s only a few seconds. I smile happily and stare. As suddenly as s/he enters, s/he exits. Flits out, over the balcony, into the palms and paper barks… and then to who knows where? Smiling again, I think of the variety of birds I see and hear each day. Like colours and the tropics, birds and the tropics also belong together. 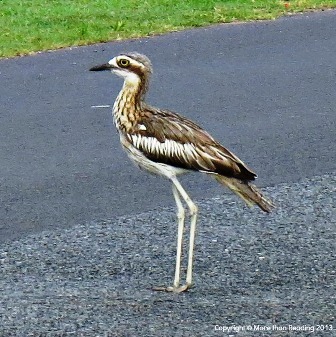 Wake early to the shrill, eerie, wailing of stone birds (or curlews) as they stroll through gardens and warily cross streets looking for quiet, shady hiding places to spend the day. 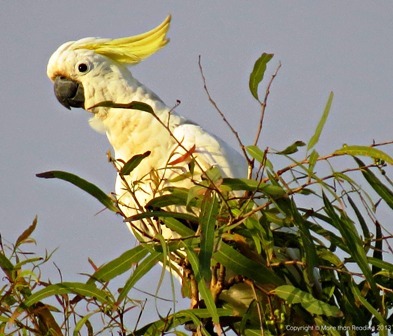 Walk to the beach to shrieking, squawking sulpher-crested cockatoos as they fly from tree to tree, calling and squabbling with their mates over breakfast. 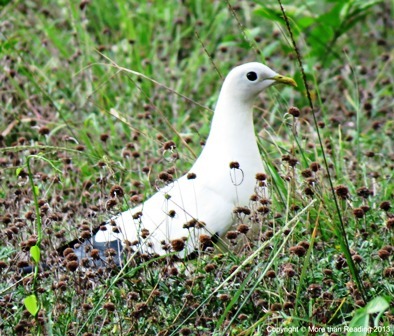 Pass a wary, silent, snow-white Torres Strait pigeon diligently pecking in the grass on a vacant block. Hear, but cannot see, doves cooing quietly in the paperbark leaves. 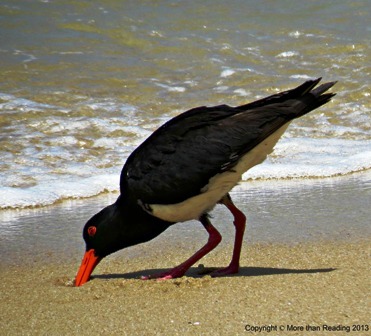 Walk along the beach and admire striking black, white and orange terns as they dig for pipis in the sand.